Published: June 8, 2015 at 12:00 p.m.
Our "15 for '15" series continues with 15 big hitters who have caught our eye. A big hit definitely revs up the home crowd; at the same time, illegal big hits can cause injuries and lead to ejections, so applauding big hits can lead to an unease among fans. Still, football is a physical sport, and these guys are among the most physical in the nation. The skinny: Gillam is an avid disc golfer (for the uninitiated, it's also called Frisbee golf), but he sure doesn't play football like a Frisbee player. 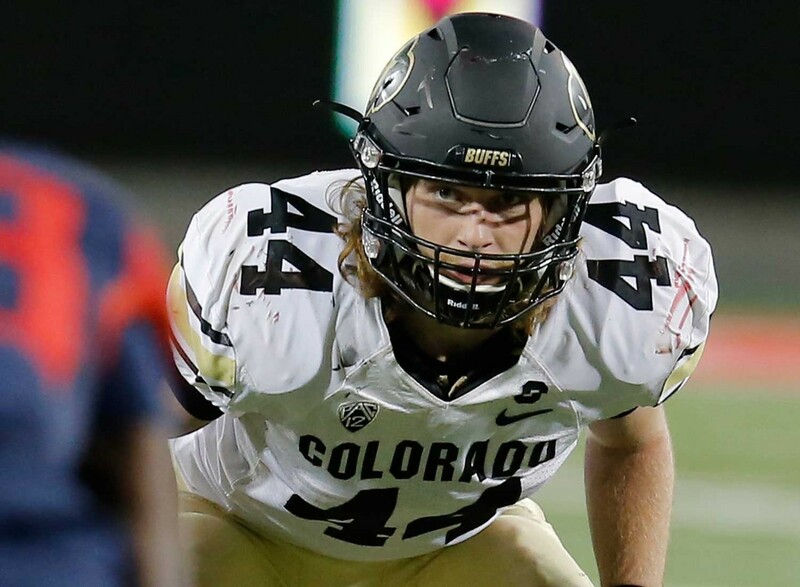 He is active and physical and has made 171 tackles in his first two seasons with the Buffs. Gillam ran track in high school (he was on a 4x100 relay team that qualified for the California state championships), so he gets to where he wants to be relatively quickly -- and he usually arrives in a nasty mood. The skinny: Hey, the guy had no issue "tackling" a tree, so, yes, he's tough and physical. He also is a punishing hitter for an interior lineman. Zettel had eight sacks and 17 tackles for loss last season; he was tied for third in the Big Ten in sacks and was second in tackles for loss. The skinny: Foster has been a reserve for his first two seasons, but is expected to play a much bigger role this fall. He has made some big hits, though, on special teams. If his big-hitting ways carry over, he will become one of the SEC's most feared defenders. The skinny: A 6-5, 230-pound safety? Yep. And Harvey-Clemons runs well, so that's a big dude bearing down quickly on running backs and wide receivers. Harvey-Clemons sat out last season after transferring from Georgia, where he had been dismissed from the team. He was a reserve as a true freshman in 2012 for the Bulldogs, then was a full-time starter in 2013. His size and physical nature enable him to play a hybrid linebacker position in the nickel. The skinny: Duke uses a 4-2-5 defensive set, with three safeties, and Cash's size and toughness allow him to play a hybrid safety/linebacker role. Duke coaches call it the "strike" position, and the terminology fits Cash. Cash, who began his career at Ohio State before transferring, was the only defensive back in the nation last season with 100 tackles, 10 tackles for loss and five sacks. So, not only does he bring the lumber, he is incredibly productive. The skinny: Florida should have one of the best secondaries in the nation, and Neal will play an important role. He was second on the team with three interceptions last season, but he is best known for his physical nature and his hitting ability. Neal plays with a linebacker's mentality (he wears No. 42 -- the same number that Jevon Kearse wore at UF -- but has a defensive back's skill set. The skinny: Come on -- the guy's last name is "Striker." For sure, he strikes fear into the heart of opposing quarterbacks. He had nine sacks last season and has 15.5 in his career. While he lacks size, he runs extremely well and can be deadly off the edge. And despite his relative lack of size, he packs a wallop. The skinny: Vallejo was a productive (100 tackles) big-play guy (16.5 tackles for loss, three fumble recoveries, an interception return for a TD) for the Broncos last season, his first as a full-time starter. He is a physical presence against the run. Vallejo has excellent instincts and is known for his on-field intensity -- well, that and his big hits. The skinny: His first name is pronounced "Daddy," so it's natural to assume Nicolas shouts out "Who's your daddy?" when he beats an offensive tackle around the edge. And that happens a lot: Nicolas had nine sacks and 18.5 tackles for loss last season, thanks to good speed and an excellent first step. And while Nicolas could stand to add some bulk, he still is a fierce and punishing hitter. Nicolas, who was born in Haiti, has been clocked as fast as 4.63 seconds in the 40 and owns a 38-inch vertical jump. The skinny: Longino has overcome a tough upbringing in Cleveland and has become a potential All-Pac-12 player; he also will be playing this season as a graduate student, as he earned his undergrad degree in May in interdisciplinary studies (with an emphasis on education and sociology). Longino is a gifted athlete who went from a seldom-used backup in 2013 to a force for the Sun Devils' ultra-aggressive defense last season. He had 94 tackles, including three games with double-digit stops, highlighted by an epic 17-tackle performance against Duke in the Sun Bowl. He runs well and generally arrives in a foul mood. The skinny: Caputo is from western Pennsylvania, and aren't all Western Pennsylvanians who play football described as hard-nosed? Well, Caputo certainly is. While he lacks top-end speed, he has a high football IQ and hits a ton. Caputo had 106 tackles last season, which led the Badgers and was ninth-most in the Big Ten. He is a physical presence against the run and has been known to punish receivers. Caputo reminds some observers of former Chicago Bears safety Doug Plank, who also is from Western Pennsylvania. The skinny: He comes from a family of hitmakers -- his grandfather, Bob, was a reggae superstar and his dad, Rohan, was a small guy known for his monster hits as a linebacker at Miami (Fla.). Forget his size: Nico is absolutely fearless and loves to lower the boom. Marley was the Green Wave's second-leading tackler last season (82) and led the team with 13.5 tackles for loss. The skinny: Cravens was a highly touted high school safety who was known even then for his physical nature; that physical nature has carried over to college football. He started at strong safety as a true freshman in 2013, then was used in a hybrid strong safety/linebacker role last season. This fall, it's likely he sees most of his time as an outside linebacker. One thing that has remained constant wherever he has lined up: The dude brings the wood. He should be able to dole out even more punishment this fall as he spends even more time closer to the line of scrimmage. The skinny: He and senior Trae Elston give the Rebels the most punishing secondary duo in the nation, bar none. Conner sometimes struggles in coverage, but, man, can he lay the lumber. He is a big hitter who is quite comfortable playing in the box. And he makes his presence known on basically every tackle. Conner was recruited as a safety but played mostly nickelback last season, a position Rebels coaches call the "Huskie." Huskies are mean dogs, and Conner plays like a mean junkyard dog -- and we mean that in the most complimentary manner. The skinny: Joseph is not the most gifted safety when it comes to coverage skills. But when it comes to punishing opposing players, whether they be wide receivers, running backs, tight ends or quarterbacks, he has no peer in the college game. He excels in run support because it allows him to be physical. The bottom line: Joseph is a tough guy who loves to deliver a big hit (truthfully, he can get a bit sloppy at times because he always is looking for the big hit). He hits a ton; he's a sledgehammer masquerading as a defensive back.